Серёг, пока в таком виде устроит альбом? А второй тоже, если шо, в мп3 покатит? I think I need to quote a bit of Cryptameria´s press kit that came along with this 4-song promo-CD as for starters: “Cryptameria is a four-piece progressive, melodic metal band… influenced by bands like Dream Theater and Symphony X, the music is geared toward fans of metal that enjoy melodic vocals, unusual time signatures, and intricate guitar and keyboard riffs…”. Well, after having spinning this promo a few times in my stereo system, volume turned to pretty damn loud indeed, I can partly agree what´s been written on it, but unfortunately in the very same breath I have found a few things where to complain about a bit, too. First off, do not ever make any comparisons to bands if your band doesn´t sound like them at all. I couldn´t find any connections to either Dream Theater or Symphony-X as far as Cryptameria´s sound is concerned. Or maybe they possibly wanted to mean in their press kit that most of the members in the band dig those two aforementioned bands instead?! Secondly, I wanna stop complaining right here because there´s not much to complain about Cryptameria´s stuff after all. The band plays some type of a progressive, keyboard-laden (which isn´t a dominating element, tho) Heavy Metal that is quite melodic, generally a pretty unique-sounding thoroughly, so you could say right off that a dawning potentiality is there for sure. At their best they sound like they would be nearly ready to record a full-length album of their own already, but at their worst there´s a few ´improvements´ in their sound they should consider doing in the future. 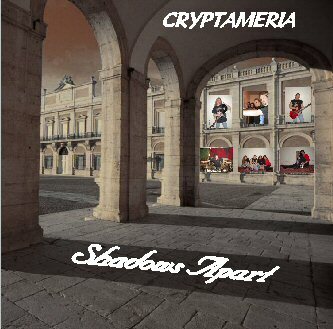 Nothing against the band´s guitarist named Harley Smith, but with two guitarists they could possibly do some miracles to Cryptameria´s sound, obtaining a more powerful and richer sound for the band which they would certainly need in my opinion. Also, Harley´s solo in the last song called “The Crushing of Time”, starting from 2:47 minute mark precisely, is totally horrendous, quite honestly. This particular ´solo thing´ should have been left out from the song simply because it´s far from being a thought-out or well-made guitar solo. It wouldn´t harm them if they paid a little bit more attention to their song structures in the future either. There´s a few tiny things here and there in their songs that simply don´t mesh seemingly with each other that well in order to be able to make a bigger impact on a listener. But most of the time these guys seem to be on the right track, churning out relatively tasty moments that catch your attention quite easily as a matter of speaking. A clear proof for all those ´tastier moments´ is the 3rd song on this 4-song promo titled “Looking Back” that even reaches a few more epic and heavier moments for my own picky likings. Cryptameria´s bassist/vocalist Kevin Lewis (also once in the line-up of October 31, f.ex.) has a powerful yet crispy voice that fits into the band´s sound nearly perfectly, I think. Дальше я у ДЭниса ничего не спрашивал.